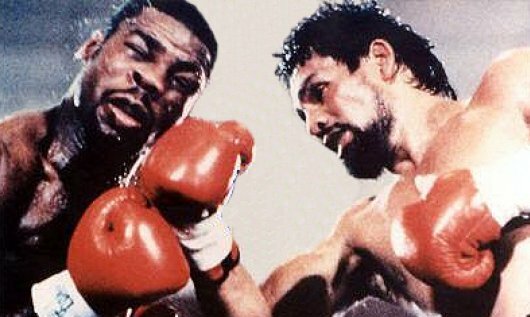 In assessing Roberto Duran’s boxing career some two decades removed from his last meaningful win, one thing is not to be questioned: “Manos de Piedra” is an all-time great. Past that, the discussion as to where he stands in the pantheon of pugilism’s immortals will continue for years to come. Some say he’s the greatest lightweight of all time; others contend he should be remembered as much, or more, for his performances at welterweight and middleweight. 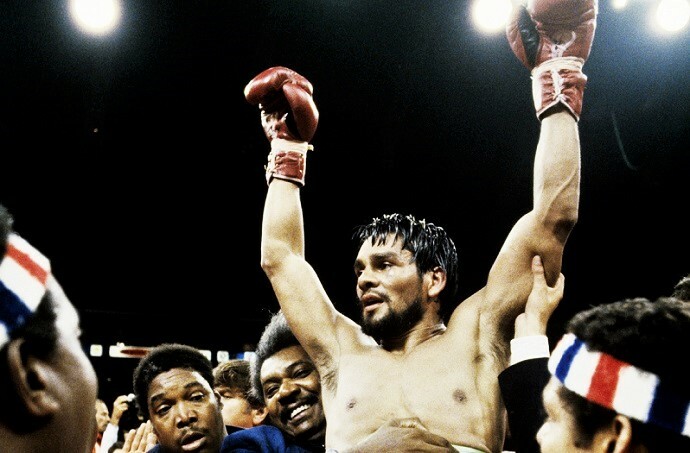 Either way, we recall here the 12 triumphs that speak directly to the greatness of Roberto Duran. And of course it’s only fitting to feature this list in the month of June, the month of Roberto’s birthday and when he scored several of his most astonishing victories. 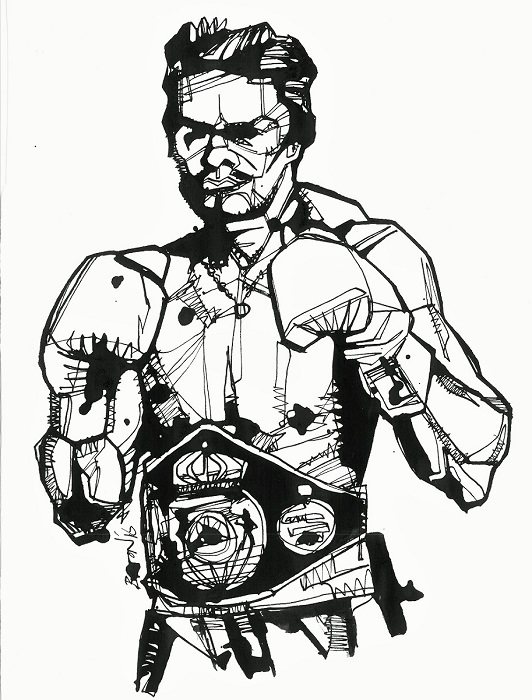 Roberto Duran: ink drawing by Damien Burton. Ishimatsu, who had several pseudonyms, had won six fights in a row for the first time in his career prior to facing Duran. Ishimatsu, then often known as Suzuki, was popular as a colorful character despite spotty in-ring performances. He had already visited Panama in a losing title bid against Ismael Laguna in 1970 and was determined to make good this time. But Duran was out to prove a point, again making his jab the center of his offense, and showing off world class countering ability and excellent defense, blending the two almost seamlessly. Five knockdowns within two rounds convinced the referee it was time to end the slaughter. Ishimatsu would go on to capture the WBC lightweight belt the following year, defending it five times before eventually retiring and becoming a successful actor and comedian. The rivalry between Duran and the Viruet brothers was not on the level of at least two other personal grudges Roberto held as a professional, but the ill feelings were real nonetheless. Edwin, the older of the two, was a former New York Golden Gloves champion who had broken Duran’s one-year, eight-fight stoppage streak in 1975 by clowning his way through a non-title bout in Viruet’s backyard. A slightly unpopular decision, plus Viruet’s claims of a fix, led to a rematch for Duran’s title. 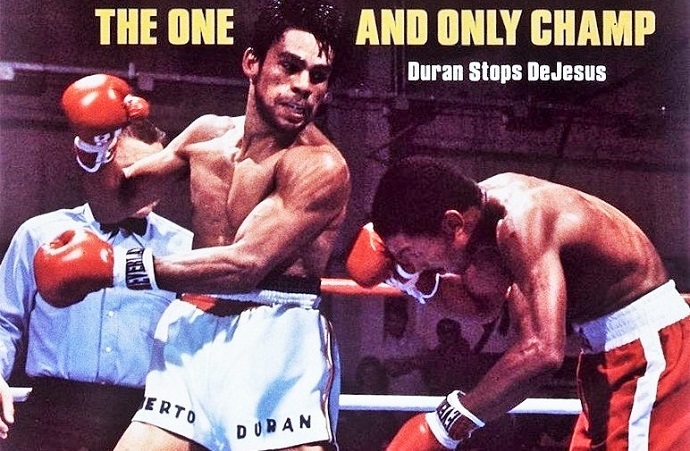 This time Duran was more aggressive, trapping Viruet on the ropes and in the corners, ignoring the moments when the slick Puerto Rican made him miss wildly and leaving absolutely no doubt who was the superior fighter, even in his first title bout to go the full distance. In Cuevas, Mexico had a welterweight champion whose left hook terrorized a chunk of the division over the last half of the 1970s. His only losses in the seven years leading up to the Duran fight were a shocker to Roger Stafford and a knockout loss to Thomas Hearns that was, quite frankly, understandable. The Stafford loss was voted “Upset of the Year” for 1981 by The Ring, and, coincidentally, Duran’s loss to Kirkland Laing took the award in 1982. When the two were paired, both had seen better days and were thought to be all but shot. Cuevas was worn, sure, but Duran probed at what tatters there were with a quick jab, out-speeding Cuevas before hammering him backwards into a corner in round four, scoring a knockdown. A wobbly Pipino was greeted with an extended assault on the ropes and went down again, barely making it to his feet before his corner surrendered. De Jesus provided a more lively nemesis than the Viruet brothers, carrying more respectable punching power and a huge legitimate win over Duran in 1972. De Jesus was slippery as well as similarly Puerto Rican, and really disliked Duran. He had bounced back from defeats to Duran and Antonio Cervantes to win the WBC lightweight title from Ishimatsu in 1976. For Duran, then the WBA champion, this rubber match was about supremacy and he seized it, though in an unexpected way, boxing De Jesus instead of attacking relentlessly. A right hand in round 12 left De Jesus crawling to the ropes so he could pull himself to his feet and Duran mercilessly battered him for the stoppage win moments later. A Mexican based out of Los Angeles, Palomino had claimed the WBC welterweight title from John Stracey in London, then made seven defenses before running into defensive genius Wilfred Benitez in 1979. Duran had just officially exited the lightweight division, citing difficulty making 135 pounds, and ex-champion Palomino was to be his first serious challenge at welterweight. Some thought this a stiff challenge, but Duran was particularly sharp that night, out-working Palomino on the inside, and feinting him out of position before punishing him on the outside. In the sixth, a sneak right hand behind a jab cracked Palomino to the canvas. He got up to stave off the attack in the seventh, but dropped just about every other round, absorbing far more punishment in ten rounds with Roberto as he did in 15 with Benitez. One of Scotland’s finest ever fighters, Buchanan ditched his longtime manager Eddie Thomas prior to attempting his third defense of the lightweight title against Duran. 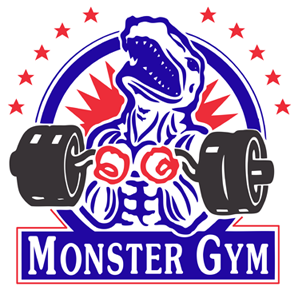 But taking on legendary trainer and manager Gil Clancy wasn’t enough to halt the progress of the Panamanian madman. 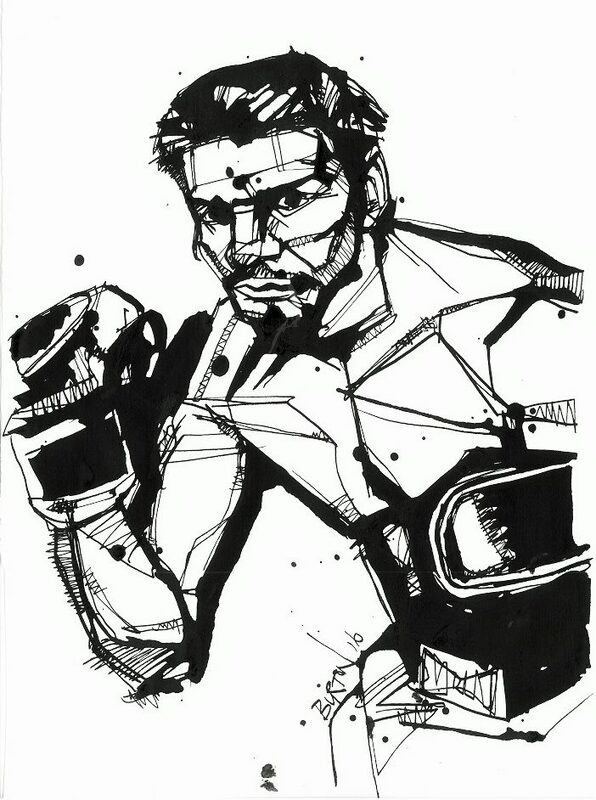 Early in round one Duran scored with a right hand that sent Buchanan down and ever after the challenger kept grinding away, round after round, with his fists, elbows, forearms, head and whatever else he could put to use. At the end of round 13 the two continued to throw punches after the bell had sounded, with Duran cracking Buchanan very low, rendering him unable to continue. A replay showed the punch was low but Roberto was awarded the win and the title, albeit controversially. Despite the injustice, Duran demonstrated a mean streak that complimented his blossoming skill set. Buchanan crumples to the canvas after being hit low. The ease with which Duran manhandled the WBA junior middleweight champion surprised almost everyone, even “Manos de Piedra” himself. A severe mugging started with a thumb to the right eye in the opening round. “Those thumbs were coming from everywhere,” said Moore afterward. But even Moore and his manager Leon Washington had to admit that Duran’s blend of speed, strength and punching power just wasn’t anticipated and the smaller man was able to do as he pleased on the inside, at times redefining the term “illegal tactics.” Despite Moore being from New York, the sell-out crowd was there to see Duran redeem himself and they cheered on the challenger as he mixed vicious head shots with a severe body attack. In round seven, Duran sent Moore to the canvas with a right hand and in round eight he gave Moore an evil beating before the match was finally stopped. Roberto became just the seventh man in boxing history to win a world title in three divisions while Moore was never the same after this defeat. It was less than 18 months since Duran suffered his first professional defeat to De Jesus, but he had rebounded with ten straight victories including defenses against Thompson and Ishimatsu. Duran’s first loss may have been a non-title affair, but there was lingering doubt as to his ability to handle adversity after having been decked in round one of that first meeting. 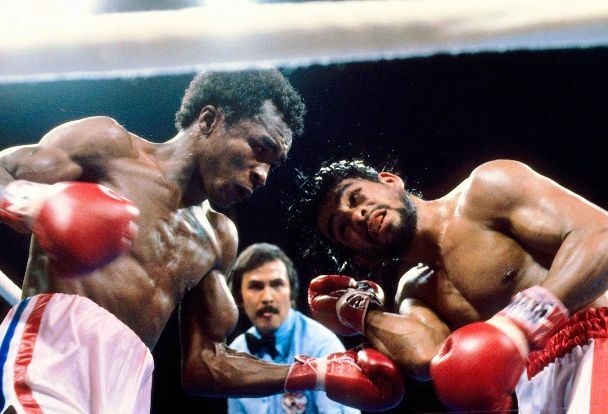 An average fighter would have been overcome with painful deja vu after being sent down once more in the opening round by a left hook, but Duran got up and by round’s end he was pushing De Jesus back. The champion said after the fight, “I never saw De Jesus’ jab, but he hit me on the chin hard.” Not hard enough. De Jesus was picked apart over the next ten rounds, going down in round seven. A hellish body assault weakened De Jesus and in round 11 a combination punctuated by a thudding right hand got Duran his revenge. Retiring after back-to-back defeats to Marvin Hagler and Hearns, Duran came back only to temporarily stay out once more when he lost to Robbie Sims. Now a middleweight, even if only a soft shell of one, Duran put some wins together and got a crack at Barkley’s WBC belt. It made no sense. Barkley was a huge middleweight who had scored an eye-popping upset of Thomas Hearns, who had stopped Duran in two rounds five years earlier. 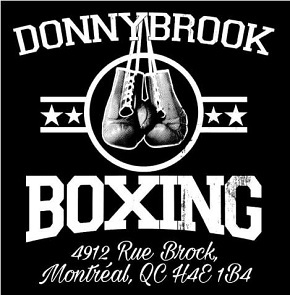 Incredibly, Duran put together another brilliant performance, wobbling Barkley in the very first round. All bets were off after that, and a gruesome clinic of body punching ensued. 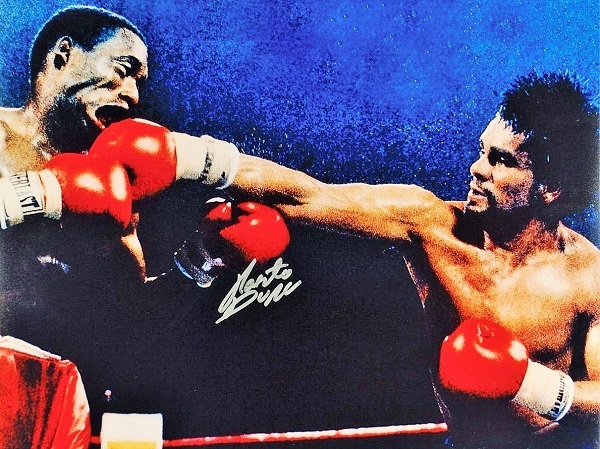 The climax came in round 11 when Duran landed a five-punch combination that froze and dropped Barkley, sealing a close win which made Duran the first Latino four-division champion. On paper, there aren’t going to be a whole heap of wins better than this one. Leonard, an undefeated Olympic gold medalist and media darling, was a 9-to-5 favorite and the larger, younger, flashier fighter. 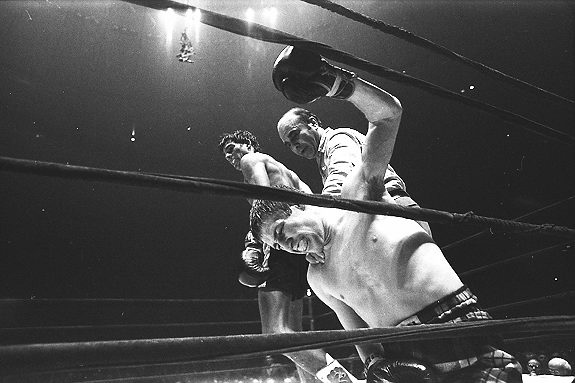 Palomino was the extent of Duran’s experience at welterweight, as far as world class opponents went, while Leonard had poked holes in the division already and displaced Benitez, who had been undefeated. Duran nunca evito pelear contra lo mejores. Su carrera fue mal manejada y mal asesorada, pero aun asi fue el mejor peso ligero y el mas grandioso boxeador latino. Enfrento, gano y perdio contra los mejores y tambien le robaron varias peleas que realmente gano como fue con Robin Sims, Vinny Pazienza y Hector Camacho. Si Durán le hubieran ayudado y administrado su carrera como lo hicieron con Chavez, De la Hoya, Canelo o el mismo Mayweather, el panameño habria llegado aun mas lejos y habria brilado aun mas. M.M. Hagler said that he got his “Ph.d” when he fought Duran. Where is the fight in the ranking? 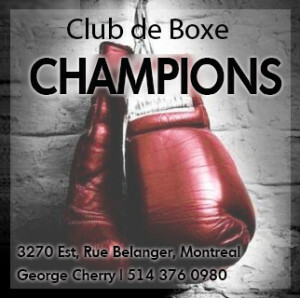 vs Palomino : that fight is 3 Micheline star boxe delicatessen. vs Buchanan: The epitome of the relentless ferocity of a soon-to-be champ. The author failed to mention the win against Ernesto Marcel.